White Shadow realizes that the only way to stop Black Shadow is to kill the mutant native that spawned them both. When Black Shadow interferes, Wolverine decides that it’s up to him to take down the mutant. But, he spawns more Black Shadows to protect himself. Meanwhile, the main Black Shadow has defeated its counterpart. And, as Wolverine is about to deliver the killing blow to the mutant, the Black Shadow has Mai in the same position. The Flying Dutchman offers Devil-Slayer excellent food and women – and then offers him a deal from Mephisto: power, wealth and women for the price of his soul. Devil-Slayer quickly refuses the deal and the Dutchman departs but not before he reveals that the Slayer’s soul is already lost – all that remains undecided is which underworld ruler will lay possess it. Devil-Slayer is dispatched to a Central American town called Potega which he quickly saves from an attacking squad of mercenaries. The Slayer makes a deal with Father Perone, Potega’s priest, to protect the town in the hopes of redeeming his soul. Aquarian offers comfort to a young woman who’s husband was just killed by her brother. She reveals that her husband was an FBI agent who was going to put her brother away but, she warned her sibling to run before he could be caught. Her brother decided to solve the situation by killing the agent – but, when his escape went sour, he committed suicide, rather than face imprisonment. With the two most important men in her life now dead, Aquarian (the ever-calm, water-walker that bears a striking resemblance to Jesus Christ) must convince her that her life is stll worth living. Namor the Sub-Mariner discovers a humpback whale that has been trapped in a small cove by changing tides. He protects it from the Sabatine Brothers, by crashing their whaling boat. But, weeks later, when the Sub-Mariner has moved on, Manny Sabatine decides to exact his revenge on the whale and now it’s up to a young, animal-lover to save the whale. 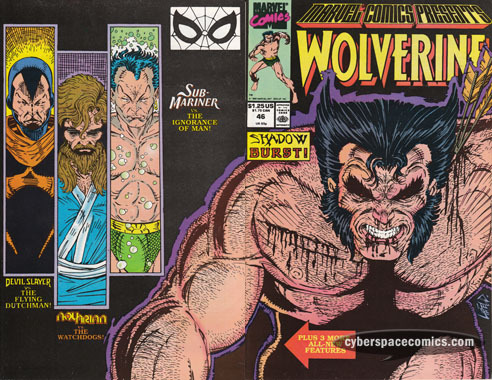 Liefeld’s created a vicious-looking Wolverine cover here – just a short while before he launched Image Comics with several other big artists. The Sub-Mariner’s story got a bit eco-preachy and has a Free Willie vibe to it. The Aquarian features seems very random – especially since I can’t place any other important appearances in other books at the time. The same goes for Devil-Slayer but I’m interested to see where his soul-redeeming storyline is going.